Built with durability and reliability, TSC desktop printers offer more memory, faster speeds and twice the warranty of Zebra. All TSC Printers support TSC, EPL (Eltron) and ZPL (Zebra) programming languages and prove to be a perfect fit for Quickbooks POS users. The TSC desktop printers are available in direct thermal only and thermal transfer models for even the toughest retail labeling environments. Too many printer choices? Call Barcode Warehouse for help in choosing the right printer for your application (888) 422-9249. Model 99-126A010-00LF, 203 DPI, 7 IPS Print Speed, 8MB DRAM, 4MB Flash, Adj Media Sensor, USB, Parallel, Serial, US Plug, EPL Language, ZPL Language, TPL Language, Bartender Lite. 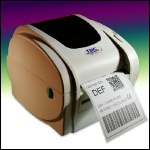 Fastest desktop label printer on the planet!! Model 99-039A001-00LF, 203 DPI, 5 IPS Print Speed, 8MB DRAM, 4MB Flash, Adj Media Sensor, Serial, USB, US Plug, TPL Language, ZPL Language, EPL Language, Bartender Lite. Model 99-039A001-42LF, 203 DPI, 5 IPS Print Speed, 8MB DRAM, 4MB Flash, LCD Display Screen, Adj Media Sensor, USB, Ethernet, US Plug, TPL Language, ZPL Language, EPL Language, Bartender Lite. Model 99-040A010-00LF, 203 DPI, 5 IPS Print Speed, 8MB DRAM, 4MB Flash, Adj Media Sensor, Serial, USB, US Plug, TPL Language, ZPL Language, EPL Language, Bartender Lite.